The SwingWave is a scientifically designed and patented swing trainer that utilizes the flow of water in a high tech designed chamber to facilitate the proper motion of the ultimate golf swing. As the golfer swings into the backswing, the water shifts in the chamber if the wrists are hinged properly and on plane. We refer to this action as the loading of the swing's energy. On the downswing, the water shifts to the opposite end of the chamber causing the player to feel the proper releasing and squaring of the clubface. Unlike evenly or head weighted swing trainers, the SwingWave’s weight shifting abilities at the precise moment when the wrists hinge and unhinge place it into a category of its own when it comes to feel and muscular memory. Feel the Motion! 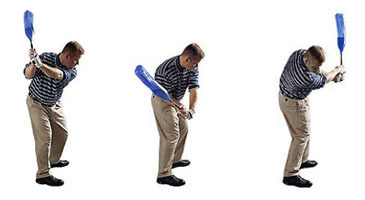 The SwingWave drill will train you to hinge your wrists properly and on the correct swing-plane in your backswing. On your downswing, you will learn to retain the power angle and release and square the clubface upon impact. 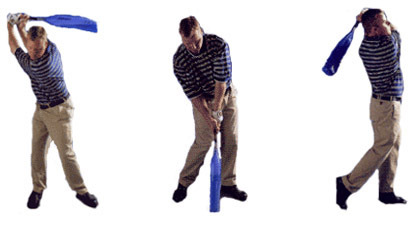 DRILL: Fill the SwingWave to your desired level. At address, hold the SwingWave several inches above the ground. Make swings at 50% of your normal swing speed. LOAD: In backswing, allow the water to settle. Energy is Loaded. RETAIN: Retain angle and on downswing gently transfer weight and allow the SwingWave to swing through. RELEASE: Water will force your wrists to release as well as simulate the squaring of the clubface through the impact area. Energy is Released. On the practice tee, alternate swinging the SwingWave and hitting range balls with the club of your choice. 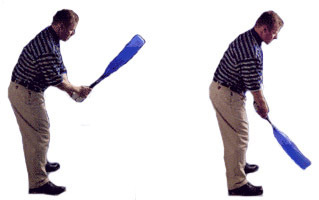 Before play, swing the SwingWave to warm up and feel the proper motion of the golf swing. Extension is the key to building a big swing arc for added distance and control. Many golfers suffer from a lack of extension in the take-away and through impact causing inconsistency. 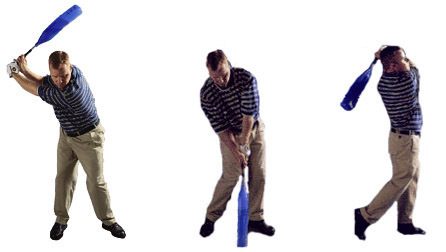 By doing the following drill, you will feel and build a bigger swing arc and maximize the extension in your golf swing. DRILL: Make slow motion half swings (waist-high) while keeping the water at the end of the chamber. Swing back with a one-piece take-away without your wrists hinging. 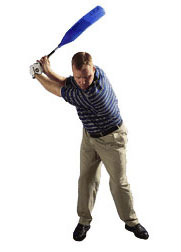 Golfers slice the ball because of an outside-inside swing across the ball with an open clubface. Swinging the SwingWave in the following drill will change your swing path and train you to square the clubface upon impact. DRILL: Swing into your backswing and allow the water to settle. Keeping your back towards your target, swing through the impact area and allow the water to settle. This drill will train you to swing the club from the inside of your target line and to square the clubface upon impact. DRILL 1: Curls: Hinge wrists upward and downward. DRILL 2: Slow motion swings from address to backswing to impact area... repeat. DRILL 3: Hinge wrists upward and turn into backswing and back to impact area... repeat. Today's tour player is stronger than ever. Tour players are focused on being physically fit and flexible. A great golf swing can be enhanced with stronger and more flexible muscles. If you want to maximize your distance, there is no substitute for strength training. DRILL: Crank it up! Fill the SwingWave to 5, 6 or 7 pounds to work out your golf specific muscles. Caution: Slow motion swings only. Swinging the SwingWave before play is a great way to warm up. Stretching will increase your range of motion as well as greatly enhance your game. We suggest developing a daily routine that includes many stretching exercises. DRILL: Make swings, keeping the water at the end of the chamber to increase flexibility and for a great warm up before play. Weight adjustable from 28 ounces to 7 pounds, which strengthens golf muscles while increasing flexibility. Eliminates your slice or hook completely by using the flow of water in a high tech designed chamber. Increases your club head speed for longer drives. Creates muscular memory for the proper swing motion. Improves your weight transfer and your transition from backswing to downswing. Learn to retain the power angle. Instant Feedback - Water shifts when your wrists are hinged properly and on the correct swing plane. Water releases on the downswing facilitating the proper squaring and releasing upon impact. Train with the SwingWave just minutes a day and experience immediate and on-going improvement. Every player, regardless of skill level, will benefit from the natural, flowing sensation of the SwingWave Golf Swing Trainer. Your SwingWave was designed to be utilized in many different drills and exercises to help you develop your swing to its fullest potential. Whether you are doing the SwingWave drill or weight training for strength and swing control, you will build consistency and confidence in your game. 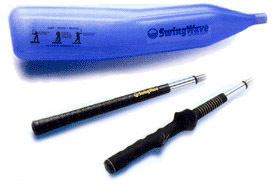 The SwingWave is a very versatile training aid with many different features. The SwingWave is used and endorsed by hundreds of golfers and instructors. Please read through some of our favorite testimonials! "THE SWING WAVE has completely changed my game in the course of only two years. I went from being a basic weekend golfer, to a top college golfer. I couldn't believe how fast and easy the SWINGWAVE changed and allowed my golf swing to feel the proper release thru the impact area. I would recommend the SWINGWAVE to any player no matter what their ability. Thank you swingwave!!!!!!!!!!!!!!!" 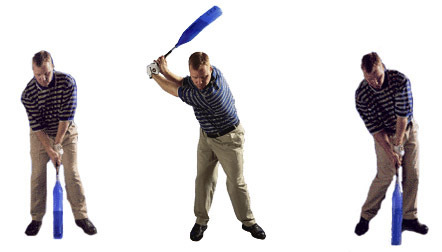 "...it trains them to release and square the clubface at impact." "It is a great tool for teaching 'release' as well as improving strength and flexibility." "The versatility of the SwingWave allows me to use this teaching aid with a variety of students." "I've seen players' swings' change instantly after swinging... It's great for improving strength and flexibility." If you have any questions regarding the SwingWave, please give us a call, we would be happy to help you with any questions you may have. Write an online review on the SwingWave, and share your thoughts with others.